Cardiac Cath Consult | Half Heart. Whole Life. While we were chugging along with Nolan and the rest of our gang, we were told by our cardiologist that Nolan’s second open heart surgery was coming soon, but that he would have to undergo a cardiac catheterization first. The 2nd surgery was already this monster looming ahead of us, so another “procedure” is definitely not something we were looking forward to. We had an appointment with another cardiologist who worked in the cath lab. He was actually a really nice guy…and come to find out he was from Connecticut just like me! Of course, I had to ask him about a pizza place I love called Pepe’s Pizza in New Haven. This is my fav restaurant EVER. He said he was sorta related to the family that owned the place. I was floored…I instantly liked this guy. But anyway, on to the serious stuff: the cath was important because it allowed them to look at the heart’s functioning up close to see if he’s readyf or the second surgery. They would look at his arteries, the Sano Shunt that was put in during his first surgery, and his heart pressures. Nolan would be brought in to the hospital for the cath and would be placed under anesthesia before the GI team would come in. Why GI? Well to this point, if you recall, Nolan has had a feeding tube since he hasn’t been eating by mouth. The G-Tube he had isn’t a long-term tube and would eventually need to be replaced by one called the Mickey Button (more on that in another post). The GI Doctor would remove the old G-Tube and put in the Mickey button before the cath team comes in to do the cath procedure. This involves entering an artery through the leg and moving a little camera up to the heart to have a look around. 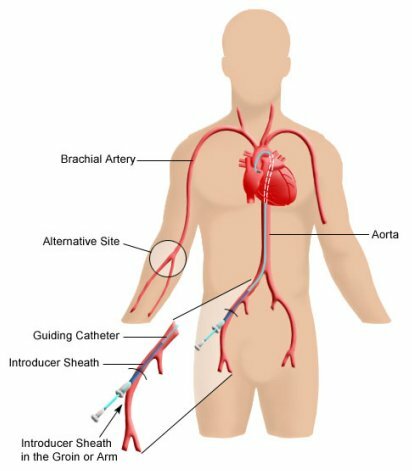 It wasn’t a lengthy procedure, but it was a necessary one…no way around the cath. The doctor told us that occasionally they’ll see some things like narrow arteries or something like that, and it’s something they can repair right there in the cath: just open it up with a balloon. They can close things off too if need be. Of course, if that would be done, it would delay his 2nd surgery until that was fully healed. The goal of the cath is to ensure everything is a-ok before proceeding with another open heart surgery. The doctor also said that Nolan would probably be kept overnight at the hospital since most heart babies are slower to get their sats back to normal after the procedure so they give them some time and observation. The doctor did also say that eeeeevery now and then the sats don’t come up the way they want and they will go ahead and do the surgery within a couple days. That freaked me out. It’s enough trying to build yourself up for a surgery, but knowing the possibility it could be in a couple days? Yeah, scary. But the more I thought about it, the more confident I felt that Nolan was going to be ok. We just had to keep praying hard. My name is Chris aka HLHS Dad: I’m married with 3 sons. I love coffee and Yankees baseball. Be kind to one another. Posted on January 17, 2014, in preparing for surgery and tagged cath, catheterization, CHD, congenital heart defect, HLHS, hypoplastic left heart syndrome, Norwood, Norwood Procedure, Sano shunt, surgery. Bookmark the permalink. 3 Comments. Thanks for reading and commenting! Caths can be scary: no one wants yet another procedure. I hope your son totally rocks his cath!